Is Gearbox pranking us with this Borderlands 3 release date tweet? If you're going to leak your own game's release date, I guess today would be the day to do it. You could always backpedal and say you were kidding. That said, a new and now-deleted tweet from Gearbox said Borderlands 3 will release on September 13, and I'm not ready to write it off as a poorly handled joke. It's easy to assume this was all a joke on Gearbox's part, but a few things make me think this was a genuine marketing hiccup and the release date is legitimate. Firstly, tweeting a false release date isn't really a joke, even for the low bar of April Fool's Day. Secondly, if Gearbox was just joking around, it probably wouldn't have deleted the tweet within minutes. Thirdly - and this just another hunch on my part - the fact that the deleted tweet used the same GIF as another recent tweet suggests some wires got crossed among Gearbox's social media team. On top of that, according to a now-deleted Twitter ad recorded by Wario64, Borderlands 3 will be exclusive to the Epic Games Store on PC. This wouldn't be a huge surprise: from The Division 2 to Metro Exodus, Epic has been snapping up all kinds of big exclusives lately, though it says it will tone down the exclusivity in time. This is all to say nothing of the fact that a proper Borderlands 3 reveal is scheduled for this Wednesday, April 3. 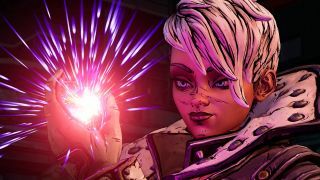 Gearbox has been promising "more information" coming on Wednesday since the release of the first Borderlands 3 trailer, so it's pretty safe to assume the release date will be shared soon. So, it's entirely possible that Gearbox will confirm a release date of September 13 this week through a proper gameplay showcase. We'll find out soon enough. In the meantime, keep your grains of salt handy, because fans previously predicted Borderlands 3 would release on October 1 based on secrets hidden in its trailer.